The StableLoad® suspension enhancement manufactured out of stainless steel dramatically improves vehicle handling characteristics by "pre-activating" the stabilizing effect designed for rear springs by keeping them actively under load the way your vehicle factory engineers designed them to operate. It’s also the only suspension enhancement that you can turn on and off with the lower leaf spring design so you can return to your factory ride when not towing or hauling. The lower quick-disconnect StableLoad is now available in stainless steel! Similar to our rugged truck camper Talon Tie Downs that are made with stainless steel, our new stainless steel StableLoads are built for tough conditions. Our engineers developed these ultra high performance suspension enhancements to handle the toughest climates and terrain. Whether you head out onto the coastal beaches or up to the mountain heights into the snow and ice where harsh chemical treatments are prevalent, nothing outperforms stainless steel StableLoads. An industry first, the stainless steel StableLoad not only enhances the look of your truck to make it stand out and be the envy of other truck owners but is also non-corrosive. This means that the stainless steel will keep the StableLoads in top condition without a layer of protective powder coat and working great to meet and exceed the toughest demands from avid sportsmen and adventurers. These suspension upgrades are always ready to push the envelope with you while keeping your family, truck and whatever you’re hauling safe. How does the stainless steel lower StableLoad work? Once you begin to tow or haul with your truck, pressure is applied on the factory overload springs of your vehicle’s suspension. The leaf springs on your vehicle are designed as a spring pack with upper and lower overload leaf springs. When the vehicle is loaded the spring pack engages. The problem is that there isn’t enough stability to support the load, resulting in poor handling characteristics. !!IMPORTANT!! This application guide is a PARTIAL LIST of the most popular vehicle applications. Due to the hundreds of makes and models on the road not all of the vehicles that can use the StableLoad are listed in this application guide. Due to varying suspension options not all vehicle models come equipped with factory overloads. Before ordering your StableLoad, please first verify that your vehicle came equipped with factory overloads, and what type of overload, (upper overload or lower overload)your vehicle is equipped with. * Applies only to the StableLoad Quick Disconnect (Lower Overload). ** Does not apply to the StableLoad Quick Disconnect (Lower Overload) A7311S (with Drill Kit). * When compared to other suspension upgrade products, the StableLoad costs up to 50% less. ** Further upgrading or product additions for vehicle suspension is the responsibility and made solely at the discretion of the vehicle owner/operator. 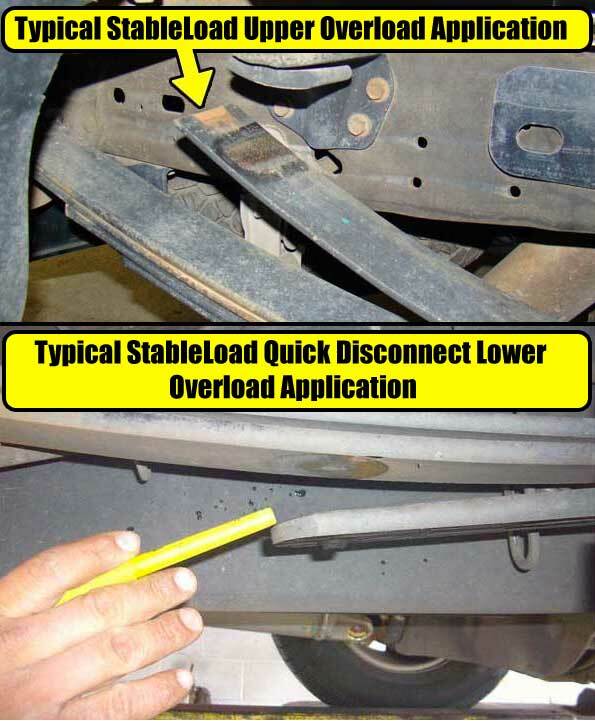 See why the Stainless Steel StableLoad is the first suspension upgrade you should turn to! ** Installation times may vary with drill kits. *** Some manufacturers offer American-made sway bars with a lifetime warranty. The StableLoad Quick Disconnect (patented) is our number one recommended most effective and versatile StableLoad. This StableLoad design is specifically engineered for the extremely robust lower overload springs. The lower overload springs are generally over 30% stronger than upper overload springs making this StableLoad design the most effective. This StableLoad design offers astounding improvement in safety and vehicle handling and is accomplished by putting the robust lower overload to work sooner dramatically stabilizing the vehicles suspension making the vehicle's passengers and load significantly safer. All StableLoad kits work equally well with or without aftermarket airbags overloads. 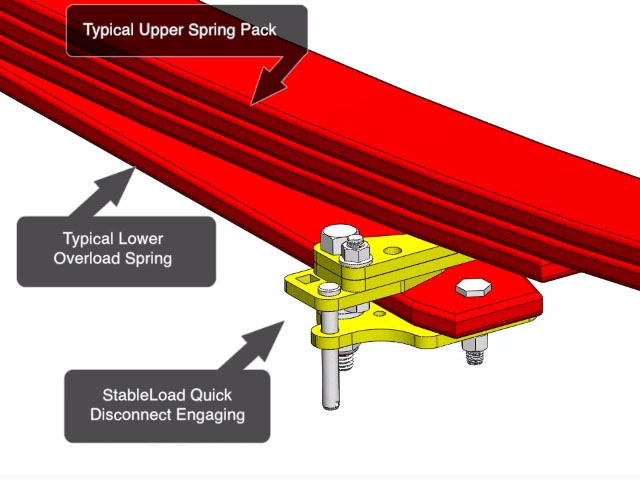 The Quick Disconnect models for the lower overload spring incorporate a unique design that allows the StableLoad to quickly engage or disengage your lower overloads, enabling you and your passengers to ride in safety and comfort when towing or hauling and to quickly return to the original ride in just seconds when not towing or hauling. This is accomplished by attaching each of the StableLoads (four per kit) onto each overload end (front and rear passenger side, front and rear driver side). The Quick Disconnect StableLoad Series is designed with a tapered wedge mounted to a hinge mechanism that allows the StableLoad to be hinged in or out of engagement in seconds using a common 3/8" ratchet extension and ratchet. Each precision crafted StableLoad kit carries our Legendary Lifetime Warranty and is proudly made in the USA. The Stainlesss Steel StableLoad is engineered for trucks, SUV's, vans, commercial applications and other vehicles equipped with lower overload springs that come already pre-drilled from the vehicle manufacturer (see application guide). The Stainless Steel StableLoad Quick Disconnect no-drill kit (part number A7310S) is available for a very quick and simple no-drill installation with amazing results. Each precision crafted StableLoad kit carries our Legendary Lifetime Warranty and is proudly made in the USA. The key to drilling a leaf spring effectively is to apply a significant amount of force, using a cordless drill with a very slow rotation speed and a well-lubricated drill bit. Using our special StableLoad Leaf Spring Drill Tool, cobalt drill bits and cordless drill, the specifically designed StableLoad Drill Tool cradles the drill allowing you to slowly guide the drill bit with little effort. No need to struggle with keeping the drill in place while applying a significant amount of force by hand -- the StableLoad Drill Tool does the work for you and is the simplest and quickest method to drill the spring. If you have decided you do not want to use the StableLoad Drill Tool, read below. The StableLoad Drill tool is available to rent for FREE. We require a $150 refundable deposit. Customer pays freight both ways. Tool must be returned within 30 days or deposit is forfeited. Tool comes with 4 extra drill bits. If additional drill bits are needed, we provide them for an additional $10 each. For more information, call us at 800.246.8132. The Stainless Steel StableLoad Quick Disconnect (lower overload) Part #A7311S (with drill kit) is designed as a universal vehicle application for trucks, SUV's, vans, commercial applications and other vehicles equipped with lower overload springs that -- DO NOT -- come already pre-drilled from the vehicle manufacturer (see application guide). The Stainless SteelStableLoad Quick Disconnect DRILLING REQUIRED kit (part number A7311S) is available for installation with amazing results. This kit comes with two specially treated drill bits and specific instructions for drilling the required (four) 7/16" diameter holes through the ends of the lower overload. The average time to complete the drilling process is approximately 35 minutes. Each precision crafted stainless steel StableLoad kit carries our Legendary Lifetime Warranty and is proudly made in the USA. "We've driven about 2,400 miles and I have to tell you the Quick Disconnect StableLoads have proven to be our best truck modification. Even with as heavy as our camper is, it's easy to forget I have such a heavy load sitting in the back or my truck. We've spent the last couple of days going in and out of Key West with narrow streets, heavy traffic and crowded with people and it really is surprising how well it handles in such tight quarters of that city. So, I can honestly tell you, I am sold on the Quick Disconnect StableLoads. For such an inexpensive investment, it's amazing, not only what it does for the truck, but for the ease of driving." See what current users of StableLoads are saying on the RV.net Forum. Your vehicle factory suspension was designed by the vehicle engineers to carry the payload on the leaf spring suspension. Overloads such as airbags can help a vehicle that is towing or carrying a heavy payload by keeping the vehicle level. Leveling improves braking by shifting more weight onto the front wheels due to a forward shift in the center of gravity and front alignment stays closer to factory specification as again the vehicle is closer to a stock level stance. The downside to airbag overloads is they accomplish all this by lifting the weight off the factory-engineered spring suspension. Your vehicle engineers designed the weight to be carried over the progressive 4' rear leaf springs. On any heavy towing or hauling set up, to level the vehicle with airbags means you have to take a majority of the weight off the factory leaf spring suspension and are now carrying that weight on an area roughly equivalent to the size of a two footballs. This is why you can actually experience a considerable increase in unsafe handling such as sway, porpoising (bucking) and body roll even though the vehicle is now closer to level with the airbags engaged. As stated above, the StableLoad dramatically improves vehicle handling characteristics by "pre-activating" the stabilizing affect designed into the rear springs by keeping the springs actively under load the way your vehicle factory engineers designed them to operate. The StableLoad accomplishes this and functions equally as well when used with or without airbag overloads. For vehicles that do not yet have airbag overloads, we recommend starting with the StableLoad prior to investing in airbags. If you're unsure which StableLoad Upper Overload or StableLoad Quick Disconnect (Lower Overload) applications, click here.